anatomical diagram and a photo of the late Dr. Ida P. Rolf. 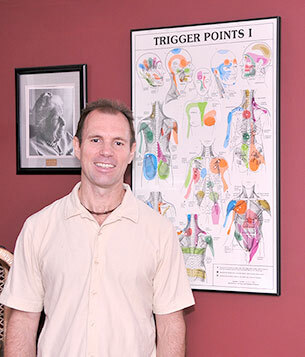 Brian has devoted himself passionately to practicing and teaching bodywork since 1988 after graduating as a Registered Massage Therapist from the D’Arcy Lane Institute in London, Ontario. Brian continued his association with the D’Arcy Lane Institute from 1988 – 1990 as an anatomy instructor. Having developed a keen interest in fascial work and structural alignment, Brian pursued his studies in the Rolf Method during 1991-92 at The Guild for Structural Integration in Boulder, Colorado with instructors Peter Melchior and Emmett Hutchins. Since then, he has pursued extensive studies in various related fields including: Cranial Sacral Therapy, Visceral Manipulation, Fascial Mobilization, Strain Counterstrain, Medical Intuition and Matrix Energy Therapy as well as presenting several workshops in Fascial Manipulation. Brian has also been actively involved in the local London music scene for over 30 years as a drummer, percussionist and singer. As a self described “health nut”, Brian has a voracious appetite for learning about body work, health, nutrition, fitness, psychology, personal growth and has also studied and practiced yoga for over 25 years.